To some people Art is History, to others their obsession is collecting antique glass or pottery. Or, ask a sports memorabilia collector what it feels like to hold a Babe Ruth Signed Baseball in his hand, the word spine tingling comes to mind. But, imagine owning a genuine piece of history from some of the most extraordinary people to ever grace the earth including US Presidents, Scientists, Inventors, and others that have left their immortals fingerprints on our everyday lives. An autograph is one of the most personal things we can acquire from these notables and cherish realizing it was a frozen moment in time during their lives. A signed President Theodore Roosevelt document represents a moment in his life in which he stopped to write out and sign this check, in between, creating ideas and making decisions that would change the world forever. Or the Thomas Edison signed photo, did he sign in the middle of inventing the light bulb or one of his other 1093 inventions. Pretty exciting when you think about it! Here we offer some of the most exciting, rare, genuine relics from those Extraordinary Humans who have made a genuine historical contribution to life, even many years after they have gone. Remarkable Autographed Treasures you're not likely to find just anywhere. We even have a few Infamous characters from the past such as the original John Dillinger WANTED poster. 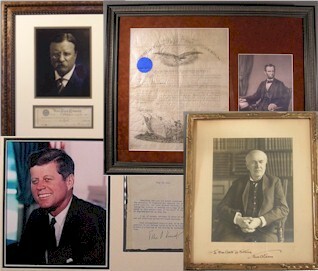 From Abraham Lincoln Genuine Signed Presidential Appointments or an Andrew Jackson Personal Signed Check to a stunning Thomas Edison Signed Photo to a famous opera singer in 1917. Imagine having one of these historical relics showcased in your home or office. * A Note of Caution! Be vigilant when acquiring presidential autographs. Because they are so highly sought after by collectors, some unscrupulous individuals are desperate enough to produce and sell autograph forgeries. One strategy to avoid being scammed by forgers is to invest in official documents and stay away from "clipped signatures" on pieces of blank paper. . For example, a Presidential Appointment signed by Abraham Lincoln is highly unlikely to be forged. In 25 years of collecting, I have never seen a forged Presidential Appointment or Land Grant. There are secretarial signatures. Andrew Jackson for example often had a secretary sign his documents but they are obvious to spot and not the work of a deceptive forger. John Kennedy had a secretary or autopen machine sign the MAJORITY of his letters after 1954, but again easy to spot by the experienced collector or dealer. Check out our latest Video highlighting "Collecting Historical Autographs"
Civil War Tintype 1/4 plate brass & long sword! Franklin D. Roosevelt: GREAT Typed Letter Signed as President. Franklin D. Roosevelt: Typed Letter Signed as President. General Douglas MacArthur Vintage Signed Photo - WOW!